Stories have always been integral to Margaret’s life. Her childhood was spent in England during and after the Second World War, when books were scarce. However, her father told stories to his children, which gave them much pleasure and began a love for storytelling in Margaret. Her working days were spent teaching in the early childhood sector in England and Melbourne, after she and her family happily emigrated here in 1982. Imaginative play, drama and story-telling were the core of her programs. 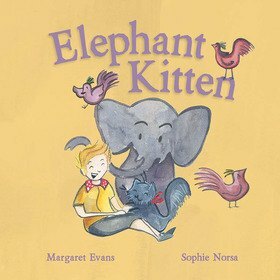 Elephant Kitten is her rst story and is based on a real-life experience when their kitten was spooked by his own re ection. It is built on Margaret’s father’s version of the episode.